I love that Fred combined two of my favourite pictures of my children to make one mosaic. Ella Marie was 3 at the time the original pictures were taken and Davis Layne was 4 days shy of his first birthday. I loved both of the pictures because they capture my children’s personality through their expressive eyes and their mischievous smiles. However, I did not have photo of both of them together that I thought was as good. 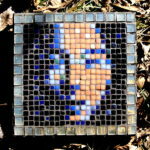 Aaron told me that he had commissioned Fred to make a mosaic for me for mother’s day, but he wouldn’t tell me which picture it was going to be taken from. I was originally worried b/c I didn’t like any of the pictures of the both of them enough to make a beautiful piece of art . 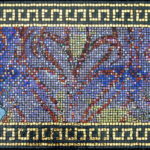 But, as Fred is so talented and I had seen his other mosaic works, I knew it would turn out beautiful. I did not know that it would turn out this beautiful! 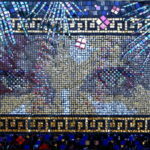 The mosaic he created captures my children even better than the pictures did! I love that the kids’ faces are in shades of black and white and the background is different colored tiles. 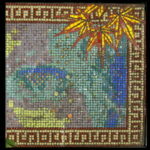 The tiles reflect the different lights that shine through my windows onto the mosaic onto the floor. It makes the whole room light around the faces of my babies! Thank you Fred for the wonderful creation!